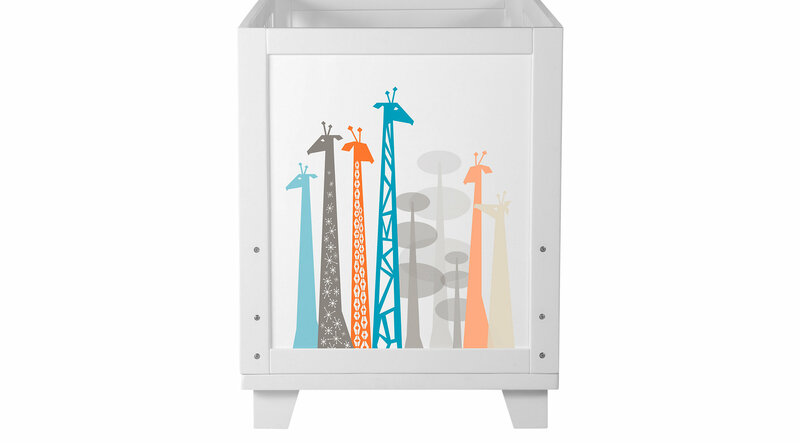 The Kolino white crib with giraffe panels will make a whimsical addition to your new little one's nursery. The versatile design makes it easy to remove the theme panels to change both crib ends to a white finish. The beautiful handpainted white finish allows the wood grain to shine through and fits any room style. Even without the giraffe panels it looks amazing. This crib is made from solid pine with a water based finish. The reinforced joinery ensures structural integrity while the solid wood construction provides strength and durability. The timeless design of the Kolino crib will keep your nursery in style for years to come..